Years ago I looked at my bare backyard and thought I should add something. I had a lot of unused space but felt trees and plants weren't what the space needed. I had seen outdoor kitchens and fireplaces in magazines and on TV and thought I would inquire with a contractor about having them built. I provided the contractors with example pictures of barbeques and fireplaces I liked and received quotes as high as $7,800 to build just the fireplace. The cost of the grill was almost as high. I was shocked at the quotes and I knew most of the money would be for labor. 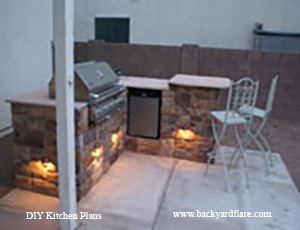 As a handy person, I decided to design and build my own outdoor kitchen and fireplace, and realized after creating my materials list that I was going to save thousands of dollars from what I would have paid the contractor. After completing my outdoor fireplace, and loving the time I spent doing it, I designed and built my outdoor kitchen and other fireplaces and outdoor kitchens for friends. Both are pictured here. By covering them with the same veneer they tie the back yard together. 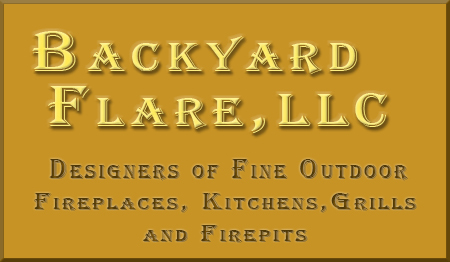 Over the years, many designs were drawn and Backyard Flare, LLC was born. 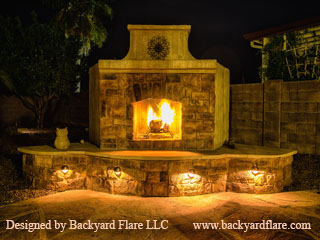 Backyard Flare was started to save you, the do-it-yourselfer, from paying contractor prices for a job you know you're capable of. Give us a try and let us assist you in building your own outdoor retreat. We know you can do it. Like we say, we'll be here with you along the way.